Update- Beetle Has Been Adopted! It brings great joy to write this update. 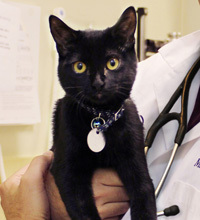 Beetle, who was thrown from a car while still just a kitten, is fully healed and has been adopted! Thanks to the North Shore Animal League and their Help Me Heal Program, Beetle was given a new lease on life and, after the necessary medical procedures, placed in a loving fur-ever home. If you’d like to learn more about the animals in this program and get info on sponsoring a pet please visit the NSAL web site. “Beetle is recovering comfortably in a foster care home that the Animal League provided. Foster care homes allow sick or injured animals like Beetle a quiet place in a home setting to recover. Foster care homes also help prepare animals to be pets. They get acclimated to a home-like setting, learn potty-training, manners and other basic pet necessities. We’re so happy to hear Beetle is on the road to recovery and is being prepared for a forever home – congratulations little guy! Every year for Christmas we sponsor animals in the North Shore Animal League’s Help Me Heal program in the names of my parents and grandparents. 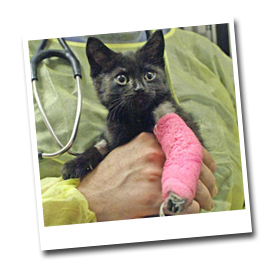 As a result we get a lot of updates about all the Help Me Heal pets, and yesterday this beautiful little kitten with a sad story appeared in my inbox. We immediately fell in love with that sweet little face. Beetle, as the NSAL has named him, was thrown from a moving vehicle and suffered numerous injuries that will take months to recover from. Lucky for him he was taken in by the largest no-kill shelter in the world! He will be treated at the Animal League for as long as it takes to get back on his feet. If you are able, please consider making a contribution to Beetle’s recovery, or any one of the NSAL’s wonderful programs. Even just sharing this link and getting the word out can help these animals in need.